Bricks - How Old Is My House? Bricks have been used to build homes since the Romans introduced them but it was not until the 16th century that it became a popular choice of material However until there could be sufficient brick works and a transport system to support them -which did not happen until the mid 19th century - it could not be the only solution. Once the railway networks were in place brickworks sprung up all over the country and bricks because the choice of the house developer . How can bricks help us date a house? Bricks are typically laid in a pattern of headers (the shorter face of the brick) and stretchers (the longer face of the brick). If they are used up right they are soldiers. Bonding is the arrangement of the bricks to form a wall or column structure. 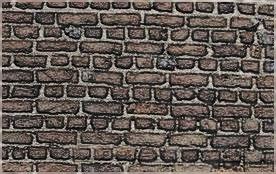 The most common form of bond on historic buildings is Flemish Bond. Modern cavity walls tend to be built in the Stretcher Bond. The joins between the stretchers are centred on the headers in the course below. This bonding pattern is one of the strongest bonds but more facing bricks are required than other bonds. Stretcher - A brick laid flat with its long narrow side exposed. Header - A brick laid flat with its width exposed. Sailor -A brick laid vertically with the broad face of the brick exposed. Rowlock A brick laid on the long narrow side with the short end of the brick exposed. Can be found from the late 17th century onwards and less so after the mid 19th centuries. This is one of the most popular brick bonds with alternating headers and stretchers along each course. ​All bricks in this bond are headers and it is mainly used on walls that need to be curved. This bond van be found on mid 19th century buildings It’s similar to the common “Flemish” bond but instead of putting the bricks on their face, they are placed on their edges. This pattern is formed by using only stretchers with the bricks in every other course staggered by half a stretcher It is used for most cavity brick walls and was first introduced in the late 19th century and is commonly found today.